This is a Korean name; the family name is Ri. 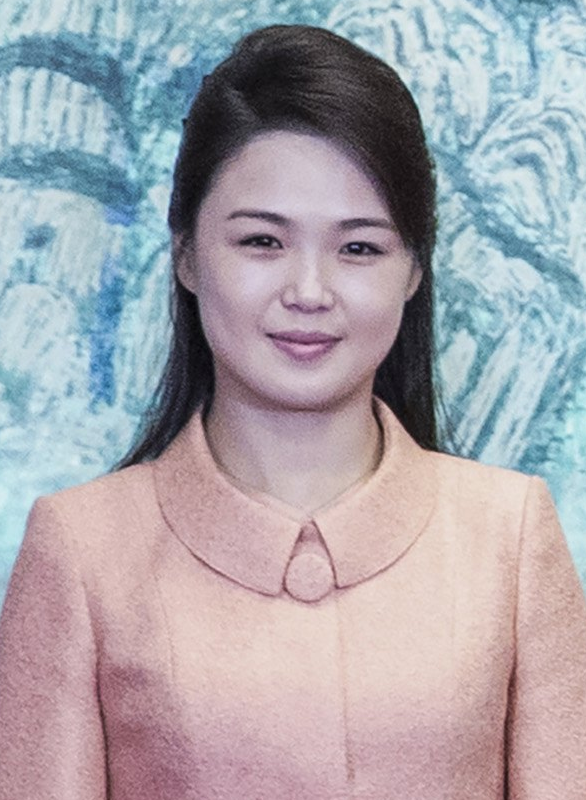 Ri Sol-ju or Lee Seol-ju (Chosŏn'gŭl: 리설주; born c. 1985–89) is the current First Lady of North Korea and wife of North Korean Supreme Leader Kim Jong-un. Little is known about her from official North Korean sources but outside sources have speculated more about her background. She is believed to have three children, though this is not known for certain. She has appeared numerous times in public with her husband. In April 2018, her title was elevated in state media from merely "comrade" to "respected first lady", considered a significant honor and the first time the title has been used since 1974. North Korean leader Kim Jong-un and his family have been characterized as "secretive". Very little information about Ri Sol-ju has appeared in official North Korean sources, but more speculative information has been reported in foreign media. In 2012, Ri made several public appearances standing next to Kim Jong-un, causing speculation about who she might be. South Korean intelligence officials tentatively identified her as Hyon Song-wol, a former singer for the Pochonbo Electronic Ensemble, a musical group popular in North Korea. However, on 25 July 2012, North Korean state media announced that she was actually Kim's wife, saying she was "his wife, Comrade Ri Sol-ju". In July 2012, at an elite gala concert in North Korea, Ri was stylishly "dressed in a trim black suit in the Chanel tradition", considered unusual for North Korean women. Along with other recent changes, such as the firing of a hard-line top general, Kim Jong-un's marriage is seen by analysts as "a continuation of what is either a policy change, or a propaganda offensive, or both". Kenji Fujimoto, the former personal sushi chef of Kim Jong-il, said he met Ri on a recent trip to North Korea. He described her as "just so charming... I cannot describe her voice, it's so soft..." As a parting gift, Ri gave Fujimoto a Christian Dior handbag, which Ri was earlier reported to have. From 2012 to 2014, Ri appeared occasionally in the North Korean media, accompanying her husband to events, but subsequently she has rarely been seen. She had long periods out of the public view in 2015, 2016, and 2017. On March 28, 2018, China Central Television showed videos of Ri visiting China with her husband, and there meeting Chinese President Xi and his wife. In April 2018, Ri's title was elevated to "respected First Lady", the first time since 1974 the title had been used in North Korea, when it was used about Kim Song-ae. Ri was previously called by state media "comrade"; the promotion occurred ahead of the April 2018 inter-Korean summit where Sol-ju and the First Lady of South Korea, Kim Jung-sook, were in attendance. She was observed as being close to Kim Jung-sook during the summits that occurred that year. Very little is known for certain about Ri; some analysts have even said her name "almost certainly is a pseudonym". Various security analysts, politicians, media and others have made public claims about her that have not been officially confirmed in North Korean media. Ri's reported year of birth has ranged between 1985 and 1989 among various sources. Ri's family is reportedly from the political elite; her mother is the head of a gynecology ward and her father is a professor. She is said to have graduated from Geumsung 2 Middle School in Pyongyang and studied abroad in China majoring in vocal music. She is said to be related to Ri Pyong-chol, a former air force general and close advisor of Kim Jong-un. JoongAng Ilbo and some commentators have identified Ri as a singer in the Unhasu Orchestra that has made several overseas performances. Reportedly, North Korean officials are "trying to erase her past as a singer and entertainer by confiscating popular bootleg CDs of her performances", such as her singing the song "Sobaeksu". She is reportedly a graduate student at Kim Il-sung University, pursuing a PhD in science. Ri reportedly visited South Korea in 2005, as a member of the North Korean cheerleading team during the Asian Athletics Championships. She was said to be among 90 cheerleaders who chanted "We are one!" Ri reportedly told a South Korean teacher while on the trip: "We want to take classes from the South's teachers after being reunited as soon as possible." The BBC, quoting an analyst who spoke to The Korea Times of South Korea, reported that Kim's father, Kim Jong-il, had hastily arranged his son's marriage after suffering a stroke in 2008. The two were reportedly married in 2009. Ri possibly gave birth to a child in 2010; sources have reported it is a boy. In October 2012, there was speculation about Ri's public disappearance, and questions arose whether it was the result of a "breach of discipline" or "pregnancy", but she later reappeared with her spouse Kim at a military college. It was followed by news reports in December 2012 that Ri was visibly pregnant, although North Korean officials did not comment on the speculation. In March 2013, former NBA basketball player Dennis Rodman visited Kim Jong-un in North Korea and on his return told the British tabloid newspaper The Sun that Ri had given birth to a healthy daughter. One South Korean government source speculated that "doctors induced labor to make sure the child was born in 2012, which marked the 100th anniversary of North Korean founder Kim Il-sung", but no exact birth date has been confirmed. Rodman told The Guardian in September 2013 that the couple's child, a girl, is named Ju-ae (Chosŏn'gŭl: 김주애). He said that Jong-un had "a beautiful family" and was a "good dad." South Korean intelligence officials reported that Ri gave birth to a third child of unknown gender in February 2017. ^ a b c d e Thayer, Nate (26 July 2012). "North Korea IDs Mystery Woman as Kim Jong-Un's Wife—But Who Is She, Really?". The Daily Beast. Retrieved 26 July 2012. ^ "观看牡丹峰乐团新作音乐会". 내나라. 4 September 2014. Retrieved 4 September 2014. ^ "北김정은 옆 그녀들, 전부다 부인 '리설주'?". 머니투데이. 26 July 2012. Retrieved 29 July 2012. ^ a b "(LEAD) N. Korean leader's wife visited S. Korea in 2005: spy agency". Yonhap News. 26 July 2012. Retrieved 26 July 2012. ^ a b c d e Joohee Cho (26 July 2012). "North Korea's First Lady Was Cheerleader, Ditches Drab Outfits". ABC News. Retrieved 26 July 2012. ^ a b c Choe, Sang-hun (26 July 2012). "That Mystery Woman in North Korea? Turns Out She's First Lady". The New York Times. Retrieved 26 July 2012. ^ a b "Kim Jong-un elevates wife to position of North Korea's first lady". The Guardian. Seoul. Agence France-Presse. 19 April 2018. Retrieved 19 April 2018. ^ "North Korea's secretive 'first family'". BBC News. 15 February 2007. Retrieved 10 December 2012. ^ "Ri Sol-ju: pass notes No 3,273". The Guardian. 30 October 2012. Retrieved 6 November 2012. ^ Lewis, Leo (25 July 2012). "Mystery woman Ri Sol-ju revealed as Kim Jong-un's bride". The Australian. Retrieved 25 July 2012. ^ "Kim Jong-Un married to mystery woman Ri Sol-Ju". 26 July 2012. Retrieved 26 July 2012. ^ a b c "North Korea leader Kim Jong-un married to Ri Sol-ju". BBC News. 25 July 2012. Retrieved 25 July 2012. ^ Sang-hun Choe (25 July 2012). "North Korean Leader Marries". The New York Times. Retrieved 25 July 2012. ^ Hancocks, Paula (19 September 2012). "Kim Jong Il's sushi chef returns after fleeing for life". CNN. Retrieved 2 October 2012. ^ a b Moss, Hilary (19 September 2012). "Confirmed: When Ri Sol-ju Speaks, It Sounds Like Raindrops on Roses". The Cut. Retrieved 2 October 2012. ^ Lee, Jeff (9 August 2012). "Ri Sol-ju, first lady of impoverished North Korea, shows off luxury Dior handbag". China Buzz. Archived from the original on 12 August 2012. Retrieved 5 October 2012. ^ "Ri Sol-Ju Bag: Lady Dior Clutch Debate Strikes North Korea". LALate. 9 August 2012. Retrieved 2 October 2012. ^ Emma Prestwich (1 November 2016). "Ri Sol-Ju, Kim Jong-Un's Wife, Hasn't Been Spotted In Public In 7 Months". Huffington Post Canada. ^ "North Korea's first lady Ri Sol Ju seen for first time this year". CNN. 3 May 2015. Retrieved 26 May 2015. ^ Caroline, Mortimer (31 October 2016). "North Korea: Fears for Kim Jong-un's wife Ri Sol-ju after she disappears from public for seven months". The Independent. Retrieved 31 October 2016. ^ "N. Korean leader, wife make appearance at air combat competition". Yonhap News Agency. 4 December 2016. ^ Robbins, Josh (11 July 2017). "Kim Jong-un's wife seen for the first time in four months ending growing speculation". IB Times. ^ Steven Lee Myers (27 March 2018). "Kim Jong-un Met With Xi Jinping in Secret Beijing Visit". New York Times. Retrieved 19 April 2018. ^ Choi Ha-young (1 April 2018). "First ladies of two Koreas meet for first time". Korea Times. Retrieved 22 September 2018. ^ "Inter-Korea summit: First ladies to bond over shared love of music". Straits Times. 18 September 2018. ^ a b Martin, Simon (28 July 2012). "North Korea's 'first lady' debut highlights secrecy". RNW Media. Retrieved 29 July 2012. ^ Ryall, Julian (17 December 2012). "North Korea: could Kim Jong-un's wife be pregnant?". The Daily Telegraph. Retrieved 19 December 2012. ^ a b c Kwon, K. J.; Lai, Alexis (26 July 2012). "Kim Jong Un married in 2009, according to intelligence service". CNN. Retrieved 30 July 2012. ^ O'Connor, Tom (27 September 2017). "Meet Ri Sol Ju, wife of Kim Jong Un and first lady of North Korea". Newsweek. Retrieved 10 February 2018. ^ Kiyohito Kokita (7 September 2012). "Kim Jong Un's wife shined before marriage as a singer". Asahi Shimbun Weekly. ^ "Kim Jong-un picked out his wife Ri Sol-ju as she sang during a concert performance". The Australian. 26 July 2012. Retrieved 31 July 2012. ^ "N.Korea Squanders Millions on Kim Family Cult". Chosun Ibo. 30 October 2012. Retrieved 5 November 2012. ^ Taylor, Adam (21 September 2012). "Kim Jong-un Is Trying To Erase His Wife's Popstar Past". Business Weekly. Retrieved 19 December 2012. ^ a b Ju-min Park (25 July 2012). "North Korea leader's wife can teach him about the enemy". Reuters. Retrieved 25 July 2012. ^ a b c d "Keeping up with the Kims: North Korea's elusive first family". BBC News. 29 August 2017. Retrieved 29 August 2017. ^ O'Connor, Tom (30 December 2017). "Who are Kim Jong Un's children and does North Korea have an heir?". Newsweek. Retrieved 10 February 2018. ^ a b "Kim Jong-un's wife reappears after two-month absence". The Telegraph. 30 October 2012. Retrieved 31 October 2012. ^ a b Kim, Jack; Macfie, Nick (29 October 2012). "North Korea leader's wife reported back in public after long silence". Reuters. Retrieved 30 October 2012. ^ Boehler, Patrick (17 December 2012). "Another Lil' Kim? Wife of North Korea's Kim Jong Un Appears 'Heavily Pregnant'". Time. Retrieved 19 December 2012. ^ Nelson, Sara C. (30 October 2012). "North Korea, Kim Jong Un And Wife Ri Sol Ju Mark 60th Anniversary of Kim II Sung Military University in Pyongyang". Huffington Post. Retrieved 19 December 2012. ^ "Images suggest North Korea leader's wife pregnant". South China Morning Post. 17 December 2012. Retrieved 19 December 2012. ^ a b c "Kim Jong-un 'Has a Little Daughter'". Chosun. 20 March 2013. Retrieved 14 April 2013. ^ "Dennis Rodman lets the world know Kim Jong Un has a daughter". National Post. Associated Press. 19 March 2013. Archived from the original on 11 April 2013. Retrieved 23 March 2013. This page was last edited on 10 April 2019, at 00:49 (UTC).